XanXeto had the most liked content! 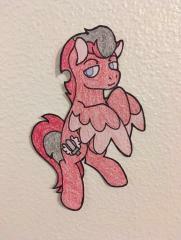 To give all of my OCs a good home and other ponies to play with. Aquilo Breeze ♥♥♥♥♥♥♥♥♥♥ "I have found All that shimmers in this world Is sure to fade... away... again." Aquilo took the shotgun slightly hesitantly. This really wasn't his type of thing, even the thought of having any gun or weaponry on his made him feel uneasy. Even so, he reached over and took the required ammo for it. As he walked out of the container, he saw that the others had their weapons of choice. It was time, they had the information and the means to protect themselves. "It looks as if everyone is ready." He began to say, then looked up at Voltaire. "Mister Voltaire... I believe it is... time." He said to him. The word time still set heavy in his mind. Just that single word meant so much to him. He knew that he was getting stares, but he just figured that it was going to be normal until this all ended. Would the ending spell and end to him as well; no matter the outcome of the others? He hated thinking this way, but he had a feeling that the metal would come down to him just as well. The question was, who would do it? He readied the shotgun and walked towards the group, a shadow following behind him. As Red went down the street, he waved and said hello to all the friendly faces. Just a few days ago, not many of them knew him, but now they called him by name. This was great, this meant that many of the ponies had listened to the radio event he did; but he already knew that from the requests he received this morning after checking the mail. He was amazed by how many others wanted to be interview by him, it really brought him joy. As much as it was getting him noticed, he knew he wasn't the only one. Dreamy must also be getting her recognition as well beyond having her shop. "Oh, I didn't even think of that. What if she's already busy? Well... I can just come in and say hi at least, and see about talking to her more later if that's the case." He said to himself as he continued on. He did remember that he asked her out, quiet well in fact. He didn't want to let her down, not by something as simple as seeming to blow her off or anything like that. He finally made it around the town where her shop was set up and went inside. He looked around and saw that there wasn't too many inside besides her; perhaps just one or two others. "She must of just opened up." He thought to himself as he came up to her counter, giving Dreamy a smile. "Hey, morning there DreamySunday." He said to her happily, then continued on. "How has things been since the interview? Has anyone come up and said anything to you about it?" Welp, time to bring in a new world here. Aquilo Breeze ♥♥♥♥♥♥♥♥♥♥ "I have found All that shimmers in this world Is sure to fade... away... again." Aquilo listened as the briefing was going on. He most definitely knew where the places they were talking about where located without looking at the map, so he just continued to listen on. Something did catch his attention, something he only kept on his mind. The way Voltaire was talking the elements more than the ones who claimed them. He supposed that made sense; to make obtaining the elements top priority, especially in case any of the three ponies were not lucky and became turned. The next topic they brought up was one he wasn't too thrilled about; weapons. As much as he was against killing others, hostile or not, there were many zombies by now overrunning the streets. Even if he took everyone to every backroad and ally way that usually wasn't busy with foot traffic, that more than likely was to be different now. After two of them stated they didn't need weapons, he looked over and saw what everyone had already; A scythe, twin swords, and, one had a huge broadsword. He shook his head some, what were they doing with weapons like these already? He could figure the scythe wielder given her reputation, which seemed like either a very personal, or sadistic choice of weaponry. Aquilo finally spoke up, letting the group hear his voice for the first time now. "I-I suppose I'll take a gun." He said quietly. Even though he said he would take one, his thoughts lead to him only wishing to use said weapon if, and only if necessary. If the plan is to cure every pony; the more they keep alive, the better. Aaaaaaah! The banner looks so nice, it really does! ((This post will be made on my phone, sorry for it not looking 'decorative'. Also, I'm getting a Gantz feel from this rp now. I'm just waiting for there to be someone in a large black metal ball.)) Aquilo's eyes widened when introductions were going out, especially when it was on him. Did Voltaire really just explain to everyone else that he was bitten?! With the description he heard of the others, especially Ember, he would be on even less time now. He sighed as looked down at this new case and opened it, seeing the suit. He began to think against wearing it. What if he changed while being in it? He would be an armoured zombie. That worry vanished when it was said that bullets could break threw it still. Perhaps he wouldn't be that much of a threat after all. He took the suit out and became undressed. He may of been rather timid most of the time, but this didn't frighten him. Most of them were grown, so he didn't fear showing most of his body off. It wasn't much to look at anyways, a slender body with lengthy arms and legs, and a still young looking face, all covered in an ice like blue short strand fur to make it like an illusion as if it was his natural skin color. Once he put the suit on, besides the fact that it didn't let his body breath, it was rather comfortable. Easy to move around in as he twisted his torso left and right as he looked around himself. So this was it, the first line of defense against the zombies biting them, or in his case, again. He heard the bickering amongst the other group members, but paid no mind to it. Instead he focused on how he could be any help to them while keeping a distance as well. There was no hiding what was going on with him, and the looks he has seen towards him were definitely unsettling. He then looked at the case the scientist gave him before he came here. Would whatever is in there really work? Where would he inject them on himself, anyways? He sighed softly at all of these thoughts. Aquilo Breeze ♥♥♥♥♥♥♥♥♥♥ "I have found All that shimmers in this world Is sure to fade... away... again." Aquilo sat in his temporary white room; at least he hoped it was temporary. The green coated pony left not that long ago, so he didn't expect any pony else to come in. When the door opened and a strange tall stallion walked in, and approached him in quite a strange manner. This definitely alarmed him, unsure of who this pony was, or what he wanted. He listened in silence to what this pony, who was named Voltaire, was saying and took the card. With everything being told, to be a guide for a group, having some kind of fighting spirit within himself, and running out of time. Time... how had he not thought about this before? Hours, precious hours have already been lost! How much sooner until it was all gone, and he too turned into one of those walking mindless beings that only cared about eating living ponies. The thought terrified him to no end. That would be it, the end for him, and he would either go down like the other zombies, or stay around as every other living pony fell. After all was said and done, and Voltaire left the room again, Aquilo looked down at the card finally. It seemed to of mentioned something about a group known as H.O.T. 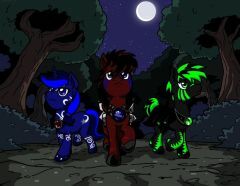 That must of been who Voltaire was mentioning when he wanted Aquilo guide some ponies. Was this really going to work? Should he really go? Was he going to actually be some help to these ponies? He didn't know the answers... but what he did know was if he did nothing at all, he was sure to become one of the zombies as well. It didn't seem like a cure was coming soon for him by these scientist, unless they were keeping it low. Aquilo finally got to talk to one of the members of the lab and showed him the card. Just like Voltaire said, they were letting him go without question. He now stood on the outside of the lab, looking out at the darkening landscape as night came and covered the land. He looked down at the card once more, seeing where exactly he needed to be. As he started to walk off, a voice could be heard from behind. "Waaaaaait!" The voice said. Aquilo tensed up before turning around, seeing who it was. It happened to be the scientist from before, now running to catch up with Aquilo. Once he did, the scientist stopped, having some kind of case with him. "I heard what's going on! Are you really going off?" He asked in a rushed curious tone. Aquilo took a moment before nodding to his question. The scientist sighed before looking straight at him once more. "Well that's a shame. I felt like we were getting somewhere. Oh well, do what you feel you must, but take these with you." He said and presented the case. Aquilo looked at it with a tilted head before taking it as told to. "Inside contains syringe shots of a compound that, when injected, should help keep your DNA stable. We obviously didn't get to test these on you yet, hence the main reason we were keeping you here." He explained to him. Aquilo had a worried expression on his face as he looked to the scientist. "H-how long do I have... until I change?" He asked in a mildly scared tone. The scientist simply shrugged at first before saying, "Not sure, that's what the test were suppose to tell us." Aquilo looked down at that news, but soon heard the scientist speak more. "All I can say is if you began to feel any extreme changes within yourself, feeling or thought wise, take one of the shots." With that, Aquilo nodded and turned around, beginning to head in the direction once again. "Dear." Aquilo heard the feminine voice say in his direction. He looked right at her and gave her a soft smile, as she returned on back to him. "You seem distracted. Are you alright?" She asked him. Aquilo closed his eyes and nodded to her. "Yes, I am Rose." He replied back to her, before continuing. "Though I do apologize if I seem distant at the moment. My mind apparently is trying to get me to think on other topics that don't really pertain to what's happening now." With that, Aquilo's eyes widen just slightly as he felt the mare's lips press against his cheek for just a second. "There is no need to worry, dear. You are here, with your family, and we will always be with you." She said with such a soothing tone, one she was known well for. "Aquilo." Three hours... nearly three more hours passing by as Aquilo moved on to the protected part of the city. His gaze lied upon the massive shield magic that engulfed it. It was rather impressive to him, but he couldn't stop and stare at it, he had to press on before he was late. Aquilo Breeze "I have found All that shimmers in this world Is sure to fade... away... again." "It's such a nice day out, dear." A feminine voice said, and indeed it seemed to be such a day with a bright sun out, warm yet with a cool breeze. A family of ponies; one stallion, one mare, and one colt, all were walking down the street, seeing many others going around and doing the attempting to get to their destinations, yet it seemed this family was out for just a stroll. They were not far from the bridge that led out from the backside of the city of Manehattan. The mare looked over to her stallion happily, a loving look in her eyes. "Aquilo." The room was brightly lit, yet Aquilo found no issues sleeping. Though after that piece of memory, his eyes quickly opened up, his view of the world around him all white and sideways. After a couple of seconds, he finally got off the bed, and looked around. His current surroundings was nothing more than a few white walls, a metal framed bed with white sheets and covers, a sink with white paint; everything was void of any other color except white. It was rather depressing to him. Just how long had he been in this room; no, cell? When he first got to this place, this laboratory, the scientist immediately tested on him, taking blood and skin samples. They limited what he could eat while he was there as well. This was all hours ago, or days ago? It's so hard to tell without a sense of time of any kind. No clocks, no windows. Was he actually a prisoner, and this was all being disguised as a means to make a weapon with what's within him. Was there anything really going on in him? These were thoughts going through the mind of a very uncertain pony who easily thought of the worse anyways. He knew why they took him when they did. Aquilo looked back at his rear legs and saw the bite mark on one of them. When the outbreak happened, he tried his best to get out, but he did not escape unharmed. One of the zombie had managed to get to him, and take a bite. Luckily for him, a few guards were close by to help get the zombie off of him before it drug him back towards the others. The rest happened quickly; the guards got him the rest of the way out of the overran part of the city, but instead of bringing him straight to were the other unaffected ponies were heading, they took him to some ponies wearing lab coats. They herded him onto a convoy truck, and not much longer after that he found himself inside this lab. After another look about in the room, the door opened up. Aquilo's full attention was now on the pony or ponies standing at the door. Sure enough, there were about three there, two looked to be guards, but the one in between and standing ahead of them took his attention the most. 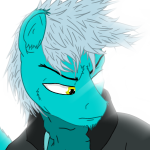 He wore a lab coat like the other scientist, so Aquilo didn't question if he was one; however what was this feeling he was getting from that pony. It was so unnatural, as if he was emitting something. He couldn't shake this uneasiness, even by breaking eye contact and looking away. Beyond that, this scientist sported a strange color; an emerald green fur coat while his mane was short and spiky, and his tail was short as well. It was two tone of orange-brown. He was also wearing goggles over his eyes, making it hard to see his full expression. "Ah, you're awake! Good, just in time to get some more test done." The scientist said with a smile. Aquilo continued to look at him, his expression becoming one of anguish, but followed the scientist as they took him from the room and into a bigger stage. The area had a clean smell in the air, as if they waxed and polished the floors and walls. Aquilo felt somewhat bad walking through it, honestly. Nonetheless, he got up on the chair when asked to, and started looking around. He noticed the lack of other scientist or any other ponies for that fact. "Where is every pony?" He asked in a quiet tone. The green pony continued onward, grabbing different tools and placing them on a push table before answering this presented question. "They won't be joining us this time. These test will not require any blood or any other samples like that. Instead, this is a more mental and physical evaluation." He said, and finally turned his attention to Aquilo with a big smile on his own face. "I am more than capable of doing this part on my own." Every bit of uneasiness, and now fear settled back into Aquilo's mind. Was this really a test, or even truly allowed? So many doubts about this, and all because of that smile; because of the presence he feels from this particular pony. No matter now, as the test started. After an hour, Aquilo sat on the table still, worried about what was next, but looking fine and unharmed. The green pony still had a smile on his face as most of the tools he grabbed earlier looked to of been used and moved around. He then began moving to another part of the room while speaking. "Alright, you've done great so far Aquilo. There's just one last test I wish to preform. It'll be simple, yet crucial." He made it over to a light switch, and before flipping it down spoke again saying, "Tell me if you can see me still while staring into the dark." With that, the lights went off. Aquilo looked straight ahead at where the green pony and the light switch was at. The entire room was dark, no other light source anywhere at all. Complete darkness, and no objects could be seen with the lack of ability to shine their colors even a little. This was insane, if this scientist's plan was to see if a pony or supposedly a pony turning into a zombie could see in complete darkness, the answer was no... at least that's what he thought at first. Another glance was beginning to prove him wrong, he thought, as he began seeing two shimmering yellow dots in the far distance, exactly where the green pony was at. He shook his head and looked again. The dots were still there, but what were they? Eyes? How could that be, the scientist was wearing goggles. He began looking around to see if he could see any other dots anywhere, but failed to do so. "Well, are you able to see me, or anything else?" The scientist asked. 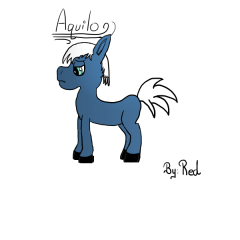 Aquilo didn't speak at first, and instead looked back at where he remember the pony being at. "I--uh... I..." He began to say shyly, then went quiet. Aquilo heard a sigh before the scientist spoke again. "Aquilo, please. This is important. Simply tell me if you see me or not." He said, this time in a slight demanding voice. What now? Would he say something about the glowing dots? "N-no sir. I don't see you, or anything else in the dark." He finally answered. With that, the lights flicked back on. The scientist looked towards Aquilo at first before writing something down on a sheet. "Alright, that about does it!" He said, having the smile on his face again. "Let's get you back to your room. Food should be ready soon, so don't fall asleep on us again; okay." 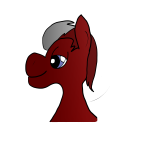 Name: Aquilo Breeze, QC Species: Earth Pony Physical description including cutie mark: Despite being an Earth Pony, Aquilo is a skinny stallion with a slender body. His coat resembled that of ice, as his short and spiky mane and tail resemble that of pure white snow. His cutie mark depicts a snowflake being blown away. Specialty: Sense of direction, withstand extreme cold temperatures, CQC (close quarters combat) if need be Psyche Evaluation: Aquilo is easy to become discouraged and often hides when he feels discomforted and hatred nearby. Nonetheless, he takes orders well, sometimes to the point where it would seem he is a pushover and does whatever anyone ask/tells him to do. History: Aquilo was born and raised in Manehattan. When he became older, he always journeyed out to the mountains, finding comfort and peace within the chilling winds usually too cold even for most pegasi. He was in the city that fateful day when he heard announcements for the evacuation, unfortunately, he was near the source of the attacks making it very difficult to escape. He managed to do so, however not before getting bit on his right back leg. Once he made it out of the city, he was immediately sent off to a hospital a ways away, but not in another big establishment in fear of this unknown virus getting loose and spreading more. Instead they took him to an unmarked location that had it's own lab set up with part of it now focused on this event and trying to prevent it. He now sits in a cell, very weak and tired as they continuously test him and take samples. Eleven hours later, and a feeling of eternity to him. He would soon look to be like one of the zombies, and not because of the virus that they believed coursed in his veins now. All of my different characters that I'll use for my RPs. Does this mean I'll use them in your rp? Maybe, but don't hold your breath. Found a character you like? 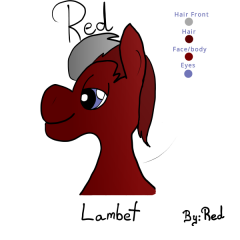 Wanna do a 1x1 with just that character of mine, or just want me to use them in your rp? Well... ask nicely and I'll see about it. Haven't seen you in a long time! How you been? The person above me is FULL OF ONE LINERS!